And just like that, tickets to the Tragically Hip's final Canadian concerts are gone. Tickets to the Aug. 5 show at the MTS Centre in Winnipeg went on sale at 10 a.m. CT Friday and sold out in less than a minute. Gord Downie, the lead singer and lyricist, announced in May he has terminal brain cancer but still plans to join his bandmates of more than 30 years for a summer tour. Joanne Schiewe is also living with terminal brain cancer and has been trying to secure tickets for herself and her boyfriend since Monday. When Downie announced his diagnosis, Schiewe praised the Hip frontman for remaining strong in the face of a similarly bleak diagnosis. "I grew up listening to the Hip; I'm a huge fan from as long as I can remember," Schiewe said. "Gord Downie's diagnosis; I mean it's the same as mine. As much as they say this could be the last tour, this could potentially be my last time having the chance to see them play." <a href="https://twitter.com/CBCMeaghanK">@CBCMeaghanK</a> There should really be a limit as far as pre-sale tickets, etc.. because I refreshed at 10 am, nothing. Schiewe said when she didn't secure presale tickets, she made the same plan as thousands of other fans to buy tickets Friday morning. Things didn't go as planned. She clicked on the "Buy best available seats" option at 10 a.m. CT when the tickets went on sale online and was met with the unfortunate news that they were all gone. "It's disappointing. It's something that I've wanted to go to since they announced that they were coming to Winnipeg and doing their farewell tour," she said. "I really thought there was a chance I would actually be able to get tickets." <a href="https://twitter.com/CBCMeaghanK">@CBCMeaghanK</a> Already sold out. Less than a minute. Lyne Morissette also said the tickets were all gone in a flash. "I had my computer on the Ticketmaster page, watching the countdown" Morissette said in an email. "As soon as the tickets became available, my computer automatically loaded the purchase page, I clicked 'Buy best available' and nothing was left. "I am incredibly frustrated.… It is my daughter's 15th birthday on June 14, and this is all she wanted for her birthday. She loves the Tragically Hip, and this will be her only opportunity to see them in concert." Anthony Toews said he tried in both the fan club and American Express presales earlier this week and got shut down in both. "It just seemed really odd that within five minutes there are no tickets at all," said Toews. 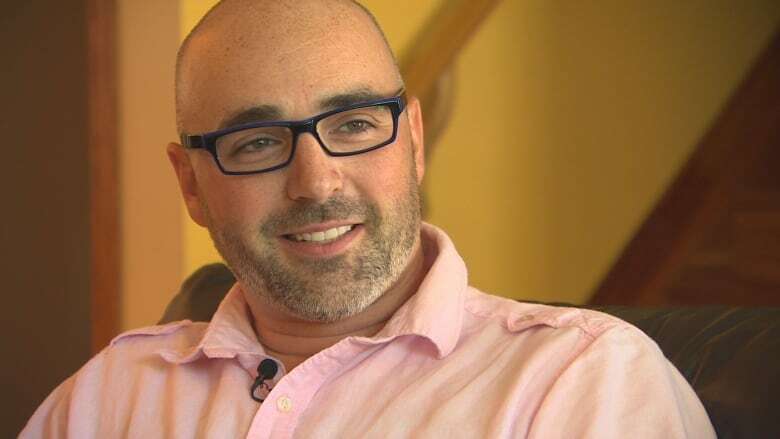 Out of curiosity, he went on Kijiji to see if it was ticket scalpers who scooped up the presale seats and said he found plenty at inflated prices. "The frustrating thing is that you think somebody out there is making money off of — you know, Gord Downie has terminal brain cancer and somebody is using that to put money in their pockets," he said. He wasn't any luckier Friday morning. "Less than a minute, not a single ticket," Toews said. As of 10:30 a.m. CT, tickets to the show available on StubHub were going for as much as $1,999 US. <a href="https://twitter.com/CBCMeaghanK">@CBCMeaghanK</a> Many people on Kijiji looking for tickets. 10 mins ago someone posted 2 for sale @ $850. Awful. True North Sports and Entertainment, which owns the Winnipeg Jets and the arena where the Hip will play in Winnipeg, said presale tickets for the band were the most in demand yet, beating out Elton John and Céline Dion. A spokesperson said True North doesn't release the number of presale tickets made available. 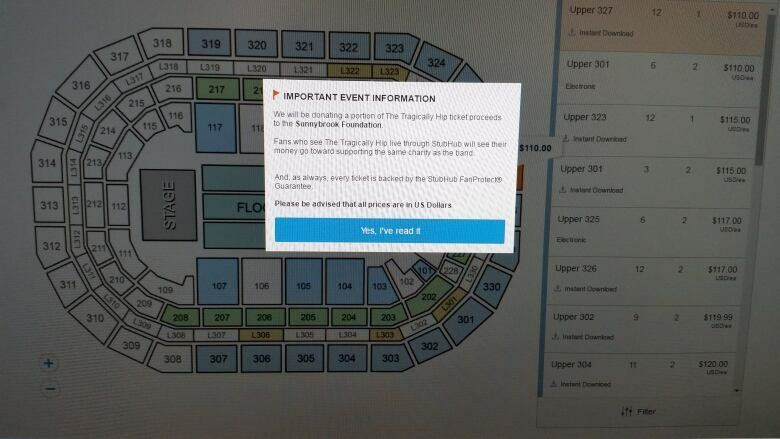 It cautions buyers to always purchase from Ticketmaster. <a href="https://twitter.com/CBCMeaghanK">@CBCMeaghanK</a> My brother was able to get 4 tickets at face value for our family on fan club pre sale. Just a lucky click I guess.